DynoTune Nitrous Purge systems Perform!! !This nitrous Purge System bleeds the air from the Nitrous line while also sending a plume of Nitrous high into the air. It comes with proper fittings to work on any dynotune motorcycle nitrous kit and is compatible with all nitrous systems. It comes with complete instructions and the superior components including a stainless steel high flow Nitrous solenoid(same as in our nitrous kit), fittings, Momentary switch, tie wraps, adaptors and enough Purge tubing to mount it just about any location. Note: Select the motorcyle application kit for motorcylce use. 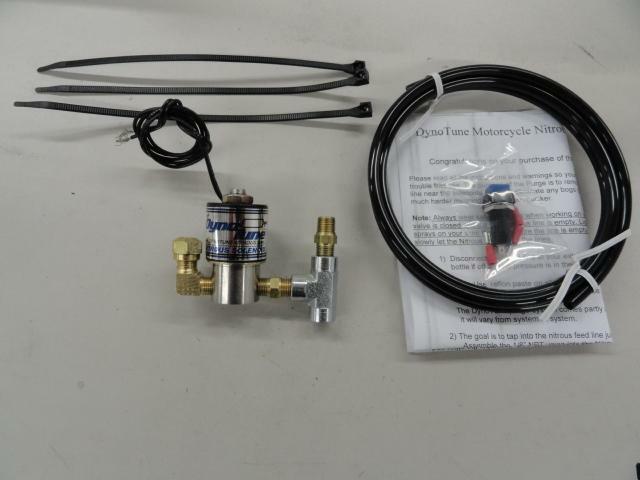 This kit will work on all DynoTune bike oxide nitrous kits. Motorcycle applications will come with a few diffrent fittings (an 1/8" NPT "T" and 1/8"NPT Coupler) to make it work with most motorcycle nitrous kits. It does not come with a 4AN or 6AN fitting so order one seprate if you need one! A nitrous oxide purge is a great addition to any nitrous system.